I recently came across the article “The Eater Doomsday Map: 50 Meals to Eat in 50 States Before the Apocalypse” on the Eater website and was intrigued by the idea. After an interesting conversation on Facebook, I decided to undertake a similar task. Rather than focus on the 50 states, I’ve decided to focus on the 88 counties of Ohio by creating my own 88 Counties List. The goal is to garner nominations for restaurants people should try in each of Ohio’s 88 counties. The only criteria is that they must be locally owned, although I will accept the nomination of local chains. Do you have a nomination you would like to add? Feel free to contact me, and include your website or weblog if you have one. The Bulldog Diner is my favorite local eatery and a regular destination of mine for breakfast and lunch. It features an old school short order diner menu along with daily lunch specials and a well stocked pie list. By far, my favorite meal there is the BLT Club and onion rings, although I swap out the rings for the Beer Cheese Soup when they have it. I’m also a big fan of the Meatlover’s Mess breakfast. If you plan to go during normal breakfast or lunch hours, expect the place to be packed. 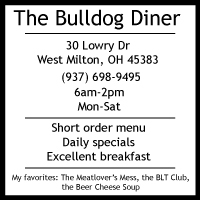 The Bulldog Diner: 30 Lowry Drive, West Milton, Ohio 45383, 937-698-9495, 6am-2pm Monday through Saturday.